Picard is ordered by Starfleet to forcibly remove a colony consisting of the descendants of Native Americans. Meanwhile, Wesley Crusher struggles to find his path in life. I'm glad we're seeing Admiral Nechayev again. All too often on this show, they trot out brand new admirals every time they need one--and Picard always knows each and every one--but with Nechayev, we're finally getting a sense that there aren't an infinite supply of admirals in Starfleet. I hate that they continually use the term "Indians." Granted, "native North Americans" is a bit cumbersome, but for a show like Star Trek, "Indians" is uncharacteristically lacking in political correctness. When Anthwara is talking about the Spanish attempt to reconquer New Mexico and the things they did to the natives, he says, "I would use the word 'savage.'" Good line. Does Picard even bother to check Anthwara's ascertion about one of his ancestors? Isn't it possible that Anthwara just made it up to get under his skin? It's again the same actor playing Jack Crusher. I'm glad they were able to secure the same actor for such small roles across several years of TNG's run, because it makes for good continuity. Though not obviously highlighted, the colony chooses to quit Starfleet ("We do not recognize that treaty") at the same time that Wesley makes the same choice. "Now you be sure to dress warmly on those other planes of existence." aybglrigbfrilyhrb! That was my head hitting the keyboard. This is the first episode that feels like the writers knew the end was coming. The title is not just a reference to the end of Wesley's Starfleet journey, but also to the fact that Dorvan V is the end of the long journey for the Native Americans, and they will do what they must to ensure that fact. The Native American stuff is really hokey, but if you set that aside, this is actually a pretty decent episode. Though it feels like the most recent chapter or two has been left out of his story--making the end seem a little bit undeserved--this is a logical send off for Wesley. There's plenty of thematic density here, there's the provocative statement being made that Starfleet isn't for everybody, and the ethical conundrum is well drawn and well solved. In many ways, this episode is a mirror image of the first season's "Where No One Has Gone Before": that episode is the fifth episode of the show, whereas this one is the fifth from the last; that episode involved both The Traveler and Wesley, with the earlier episode directly setting up this one; etc. It's also interesting to see Picard doing something he knows is morally ambiguous if not flat-out wrong, but it's kind of unnerving that the solution to the dilemma is only solved by him--with a fair amount of dumb luck that the Cardassian officer was willing to back down--after Wesley forces his hand. 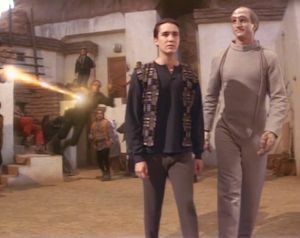 It's never stated directly, but it seems pretty obvious that Dorvan V is where VOY's Chakotay comes from.